James Flora was a graphics genius, my first serious design influence, and later my great friend and collaborator. He was endlessly inventive. I called his drawings “visual jazz”. I first discovered his work while shopping for jazz phonograph records in 1945. He was then a graphic artist for CBS’ Columbia Records Division, doing album covers and promotional leaflets which were distributed to record shops. His stuff knocked me for a loop, and I strived to copy him! In 1945 I was working as assistant to Art Director Jim Cantwell at CBS Radio in Hollywood, and was able to try some things in Jim’s style for radio show promotion pieces. I never copied any of his specific artwork, but just tried to get a handle on his style. I was mesmerized by it, and I produced some Fake-Flora mailing pieces! It was “in the CBS family,” so I figured I could get away with it. 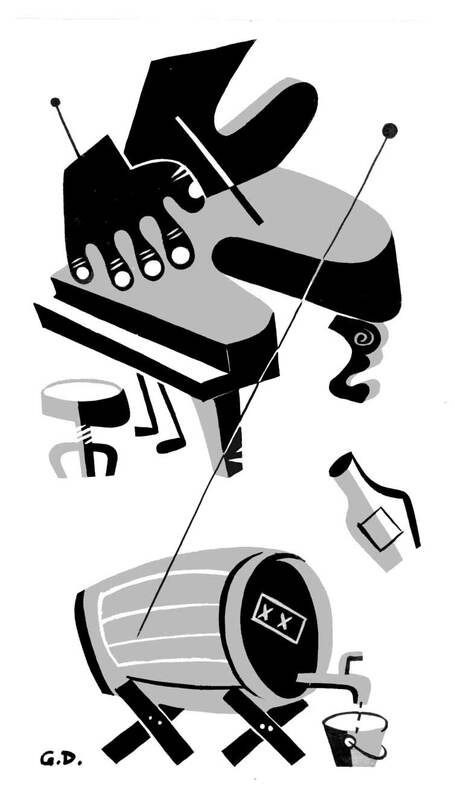 At the same time I worked for CBS, I was moonlighting, doing my jazz cartoons and covers for The Record Changer magazine. And of course much of my early stuff for the RC was Flora knockoffs. You can check this out in my book of Record Changer artwork, “The CAT On a Hot Thin Groove”, published by Fantagraphics. Inserted below are some samples. Years later, in 1957, when I was Creative Director of Terrytoons, another CBS company, I had my first chance to do an animated adaptation of one of Jim’s children’s books. 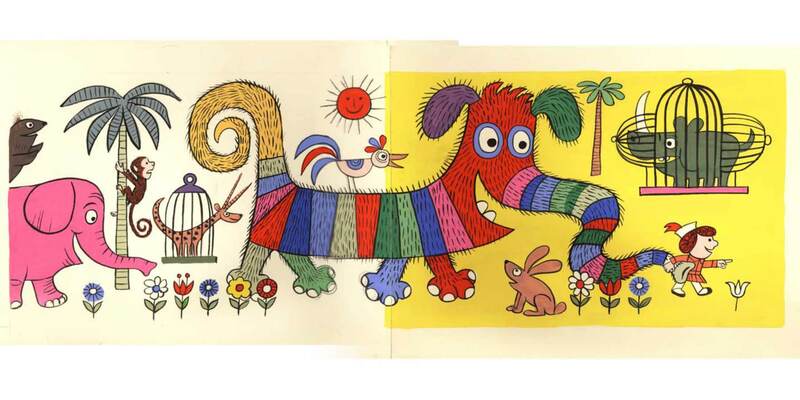 It was “The Fabulous Fireworks Family” – a story inspired by Jim’s visit to Mexico. So we finally met. My earlier incursion into his style had actually tickled him. We immediately became lifelong friends. Still later, in the 1980s, together with Bill Bernal again, who also became a friend of Jim’s, we were able to do another animated film. By this time, I had already been 8 years in Prague, and here we produced Jim’s “Leopold The See-Through Crumbpicker” which got into the Weston Woods catalog and won new fans for Jim, and some prizes for us. I was able to get the great Czech composer, Petr Eben to do the score. It was a happy production, and great to be working with Jim again. He came to Prague to visit us, and was charmed by the almost bizarre conglomeration of towers. He felt that the town was almost a parallel of his graphic work! He especially loved the towers at each end of Mostecka Street, where I lived at the time. Jim thought I was so lucky to see this inspiring edifice, right outside my door. See the photo below! Jim was a jolly, apple-cheeked middle-ager by the time we met. He was pleased that I was trying (vainly) to copy his stuff. Anyway, I finally gave up. Jim was, I repeat, endlessly inventive and no one could match him. I was not the only graphic artist under his spell! Tragically, Jim died still in his prime. His last letter to me was heart-wrenching. I hope you won’t be offended that I’m publishing it at the end of this chapter, but will be inspired by it, as I was – the final inspiration I received from this great person!!! Jim was a charming genius, and his early death was a loss to the world. I’m grateful that Irwin Chusid is keeping his artistic legacy alive! You can sample Jim’s work here. The photo of Jim is one I took on a walk with him in New York in January, 1970. 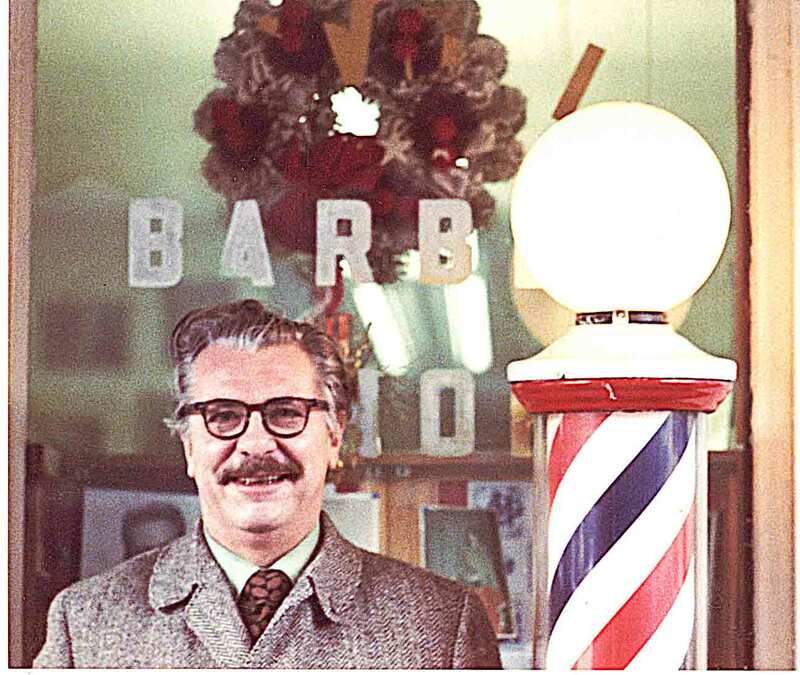 He loved the traditional design of barber poles! 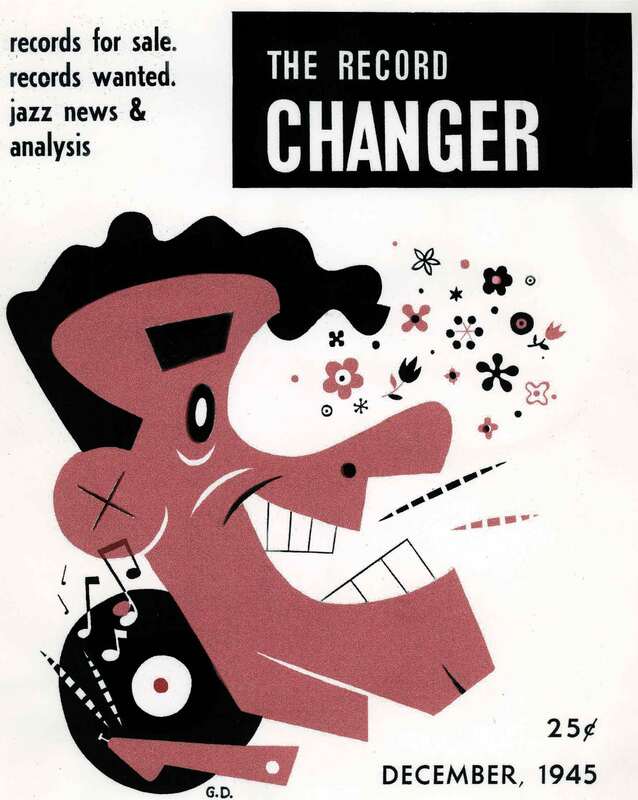 The Record Changer cover was one of my “imitation Floras,” and so is the other drawing. To see the real thing, go to jimflora.com. Jim Flora in New York – 1970. 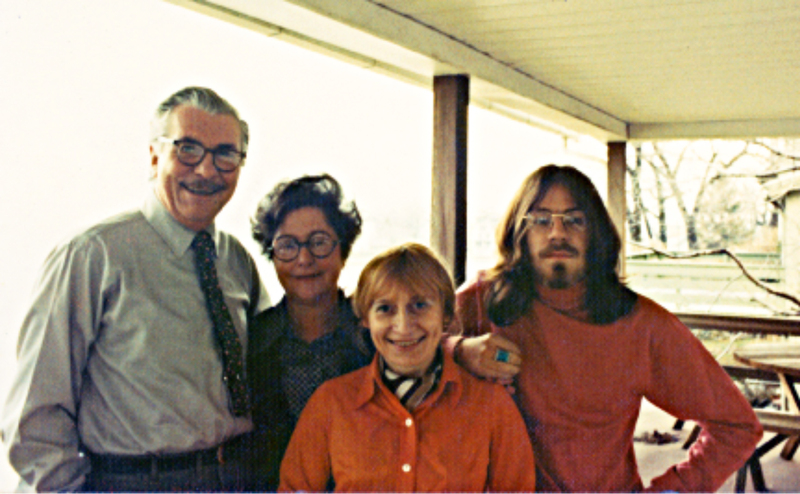 Jim Flora, Jane Flora, Zdenka Deitch, Seth Deitch – 1972. 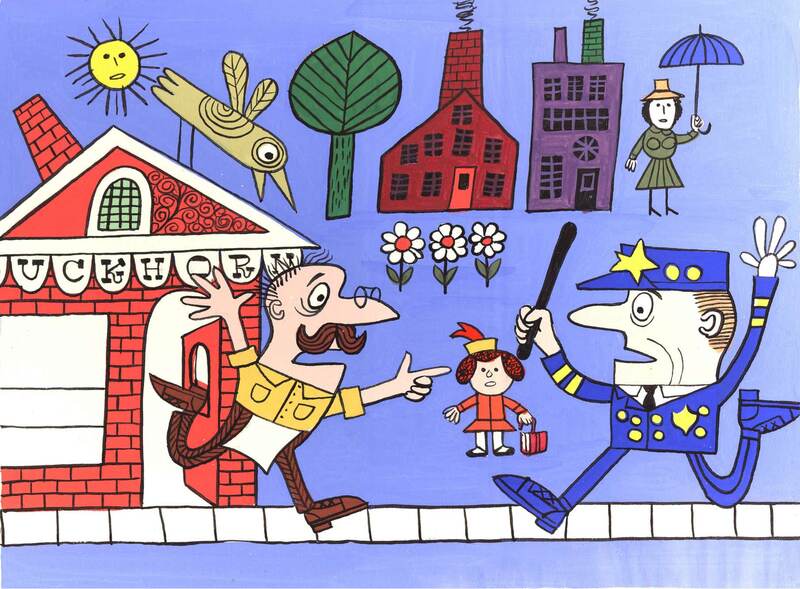 This is a scene from LEOPOLD THE SEE-THRU CRIMBPICKER, a film I adapted for Weston Woods from the book by James Flora. This was my first cover for The Record Changer Magazine, clearly snatching Jim Flora’s style in his CBS-Columbia Records ad brochures. 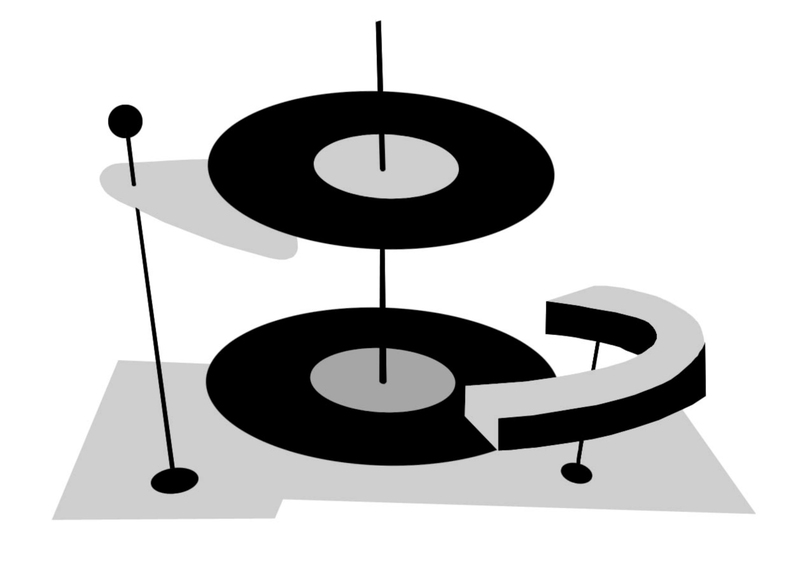 These two pictograms I did for The Record Changer magazine, show how I was hooked by Jim Flora’s early CBS ad illustrations. This is this is the two-towered St.Nicholas cathedral at the top of Mostecka street where we lived when when Jim Flora visited us, and which so fascinated him. 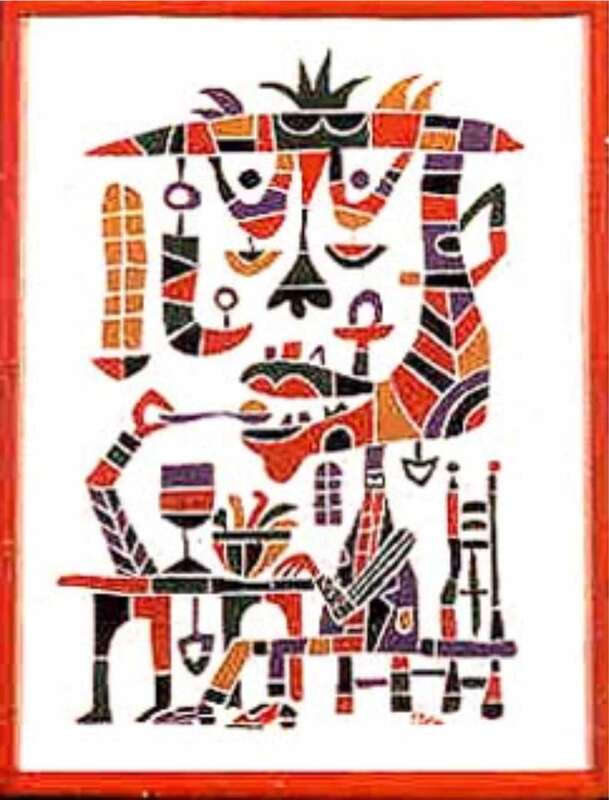 Here is only one tiny sample of the real Jim Flora, titled “Dinner”. Jim’s last, crushingly sad, yet inspiring letter to us, June 16, 1998. Fascinating stuff. At the time I met Mr. Flora, I had not a clue about his significance. I think I’m all of 15 years old in that photo with him. Gene —- this is a terrific testimony to your great friendship with Jim Flora and his ‘inredible’ graphic illo art! That letter is a heart breaker. I knew Jim Flora also. As it happens he gave me my very first job (1952!). I was just out of college showing my stuff around, and went to Park East Magazine where he was the art director. He must have been half blind then (or maybe he wasn’t wearing his eyeglasses) but he gave me a full page to do. And paid me 100 dollars for it. I no longer have the 100 dollars, but I still have that page. And that memory. Well. That is a pretty unforgettable chapter. And no mistake!